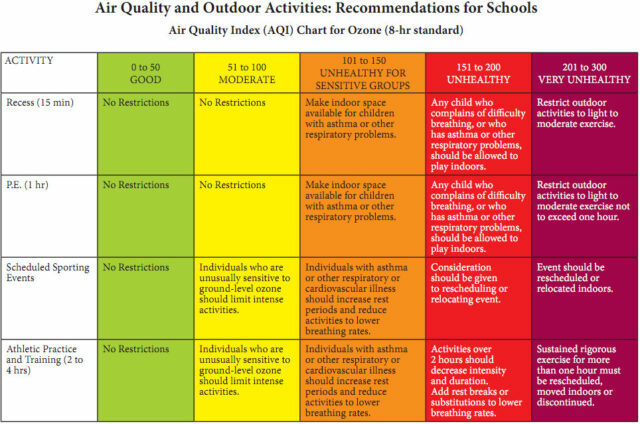 The most evidence-based official air pollution action plan for schools states that no outdoor activity should be held when the PM2.5 AQI is above 200, with severe restrictions from 150-200. Anyone who tries to enact school action plans with higher cutoffs of 250, 275, etc. really needs to provide strong scientific evidence why their criteria should be less stringent. Using higher cutoffs for the simple reason that this would be “too disruptive” is not a morally justifiable argument. And not having an action plan at all in Beijing, in schools nearby the US Embassy, is simply not acceptable. Local politics does not trump universal science. I state this upfront because I wanted to get your attention to a good news/bad news document. The good news is that I’ve finally found two credible and official school air pollution action plans: one from the most polluted parts of the US in California, and another from the US Environmental Protection Agency’s website. I’ve been scouring the WHO and other places and this is the best I’ve seen anywhere. So that’s the good news: our local schools finally have a guide from credible sources for our own action plans. The bad news is that their school activity cutoffs are likely much more strict than what most schools are now doing, and this means more limitations than before. And it soon could be even more strict, as the California scientists are discussing revisions which will lower their highest restriction from a PM2.5 AQI 200 down to 150. And that’s only for the healthy kids; for those with asthma and other diseases, the restrictions are even more strict. And since the annual average PM10 in Beijing is ~140 AQI, and the US Embassy’s PM2.5 readings are often higher, you see how disruptive such strict adherence could be. I think I’ve made it pretty clear, today and over the last two years of this blog, that it’s my personal opinion that Beijing schools have a moral imperative to provide a safe environment for their students, and that air pollution action plans are now essential to us lucky Beijingers because we can access hourly PM2.5 data from the US Embassy — a luxury that no one else in China currently gets. My views are my own, and mine is not an official policy statement of my clinic or any other company, so you’re perfectly welcome to disagree with me. Having said that, I honestly see no reason now why Beijing schools couldn’t simply adopt the San Joaquin Valley plan above (first image) and follow the US Embassy’s AQI. I think it’s perfectly reasonable to debate the cutoffs, but again you’d have to have a good reason why not to follow what seems to be the world’s most well-researched recommendations. And again, there really is no excuse for not having any plan at all. One more thing: simply keeping kids inside the gym on bad days is not a total cure — not if your school isn’t controlling their indoor air systems with proper air filters. If the kids are playing in the gym on an outdoor AQI day of 300 but the gym AQI is 250, that’s not much of a help. ahem. And why is indoor air just a tad bit better than outdoor air? Because human beings and any other breathing thing in that building is acting as a LIVING AIR FILTER every moment. Yes, you’re always “cleaning” the air and depositing it into your lungs and bloodstream, awake or asleep. Pretty sick. And all you have to do is look once at the greasy black fuzz that builds up on the bottom of the IQ Air filter (over just a couple of weeks) to know you would not live here without one. Excellent Post, every parent in Beijing needs to read it carefully. Thanks! You bring up a good point about indoor air which I’ve often stated: 90% of our lives are spent indoors, and indoor air is usually ~50-80% of the outdoor air levels — sometimes much higher especially in smoky bars. So it is indeed not good enough simply to stay inside when the AQI is crazy bad 500; your indoor air at that time definitely is also bad, if you don’t have air purifiers inside. Protect their kids’ air at home immediately. Band together. Make contact with the PTA and get this on the agenda. Circulate Petitions to make a school policy which is helpful and stringent. Fundraise for a big custom IQ Air whole-building filtration system. They do this. You can divide the cost among all the families of kids in the school, if enough parents support it. A _____rmb per child surcharge per year. This is doable in most schools. A fee to support the installation and filter maintenance. rant: These For Profit schools drive me crazy. We are CONSUMERS of their PRODUCT and should be demanding they protect our kids rather than line their fat pockets. If ONE school steps forward in this area, they will see kids flocking to their school. Step Up, Someone! I agree about the need for more official “PTA-style” standards. I mostly worry about the local Chinese schools, not the expat schools, many of which already have filters and air alerts. Local schoolkids deserve the same protection as expat kids! How to get the Chinese educated enough, riled enough and BOLD enough to take a stance? Can change like this actually be sparked and led by the very people it affects? Or do people here just wait patiently for policy changes like this to come down from on high? Maybe it’s an unfair misconception on my part, but they seem to believe (or be conditioned to believe) that they are powerless in all things. Don’t give up: first, obviously most local Beijingers would have no clue, nor any internet access, to use the US Embassy’s Twitter feed. Plus it certainly isn’t an “official” website for local schools to follow as a rule. But a more important point is that in the last 3-4 weeks there’s an extraordinary explosion of public debate and education all over China’s media about PM2.5 air pollution, mostly sparked by Beijingers discovering the US Embassy’s monitor and following people like me on Weibo who have been publishing results. It’s already reaching the point where a Weibo poll shows 95% of people want PM2.5 monitors ASAP and really admire what the US Embassy has done. Ahhh A Rabble Rouser! I always knew you had it in ya.. I would have a concern which is indirectly related to your blog entry. Winter is now coming and many buildings in Beijing use Central Heating Ventilation. It basically means that some hot air is introduced into all rooms of our apartments. I believe the hot air is usually not filtered. In that case, is that still efficient to have green plants and air purifiers at home? Plants are always a good idea; some office buildings may have adequate HVAC systems but honestly I wouldn’t take anything for granted. You can always hire one of the many companies to test your air. Mike Murphy from IQ air told me that this is depending on the type of system you have. He seemed to indicate it’s common for modern apartment buildings to have 3% fresh air intake continuously. This seems low but is bad news. We keep the IQ airs on high settings 24/7 (only open windows on very low aqi days- rare). And we minimize the use of the air heating/cooling units, using oil space heaters or humidifiers instead. Warm steam works best but any type helps as humid air feels warmer. Even a pot of tap water on the stove helps with this. Yummy holiday scent if you put cinnamon or clove in it. Top floor apartments will also get warm midmorning after the sun is high, especially if the cloud coverage is low and the sun is direct. HTH. In regard to carcinogens, younger children are much more vulnerable to air pollution’s effects. since children’s cells are multiplying rapidly, so their DNA is damaged more easily. A baby under 2 is at ten times the risk as an adult. A child over that age is at 2-5 times the risk I think it said. Most concerning on a broad scale is that Air Pollution causes heritable DNA changes – mutations that are passed through generations. http://www.exploredna.co.uk/pollution-effects-dna.html since children’s cells are multiplying rapidly, so their DNA is damaged more easily. A baby under 2 is at ten times the risk as an adult. A child over that age is at 2-5 times the risk I think it said. These articles are always interesting, but also so frustrating because they are clearly pitched to large private schools. The vast majority of kids in Beijing aren’t in schools with air filters or gymnasiums. I always come back to the point that we need an action plan for overall air quality, not to coping strategies that cannot be afforded by the vast majority of people living here. How does not exercising and plugging in an energy consuming (therefore polluting) filter improve air quality? All well and good if you can buy your way to health, I suppose, but most can’t. And then they can’t afford to treatment for resulting health issues. Somethings got to give besides my lungs in this town. Good points. For “overall air quality”, that’s definitely a macro-level public health issue which the government must push, and they are, but clearly the task is enormous. In the meantime, as the PM2.5 increases each year 3-4% as Chinese newspapers discussed this week, are we supposed to just sit around and do nothing, when we know the risks are real? Great article – thank you. As a family that has recently moved to Chengdu can anyone provide any links as to how to monitor daily air pollution levels? Does the US consulate have a site perhaps? The only Chengdu air pollution I know is from the official monitors; you can access the data from the smartphone app “China Air Pollution Index”.